Once you have reviewed your house for air infiltration and have taken care of those issues, you should review your homes insulation. Depending on which source you listen to, heating and cooling your home accounts for 40 - 70% of your energy consumption. With numbers like that, insulation can play a huge part in conserving energy. 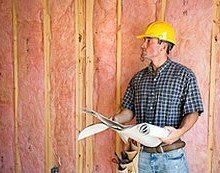 Insulation is rated by R-Value. The higher the value the more effective the insulating properties. Some people believe that insulation only helps you keep your home warm in the winter but in all reality it also keeps your home cooler in the summer. Adding insulation between the floor joists of your unfinished basement or crawl space will help keep that cold air out. Another area is the floor in your attic space. There are several different types of insulation but the most typical are batt and blanket. Batt insulation comes in shorter lengths packaged in pieces while blanket comes in rolls. Both are easy for the do-it-yourselfer to install. If you can't get standard insulation in some nook and crannies, you can use loose-fill insulation. This cellulose type is made up of recycled newspaper and is fire-retardant treated. This type can be blown in or just poured out of the bag. If you are leaning towards mineral fiber or fiberglas loose-fill than you are going to want to have a professional do this. They have the right pneumatic equipment to get the job done correctly and safely. 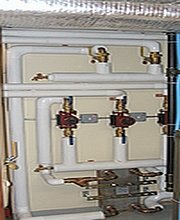 Pipe insulation should be put on all hot and cold water lines. They will use much less energy to stay that way. Overall, insulation is a low cost preventative measure that can make a dramatic difference in making your home more energy efficient. You can count on 10 to 20-percent loss associated non-insulated or inadequately insulated ductwork and pipes. Along with insulating your pipes and ductwork, you may want to consider using a hot water heater wrap. Especially if you have an uninsulated basement space. These wraps are designed to improve insulation, prevent heat loss and promote energy conservation. Manufacturers claim they save up to 35% of energy usage. Although insulating these items will not prevent them from freezing if put into that situation, but it will slow down the process.